In 2016, Philadelphia remained as gorgeous as ever, from its most historic establishments to feats of contemporary design. Because our town is so dang good-lookin’, people like taking photos of it. Turns out, if you look through Instagram, you’ll learn that our photo culture is very vibrant and very strong. 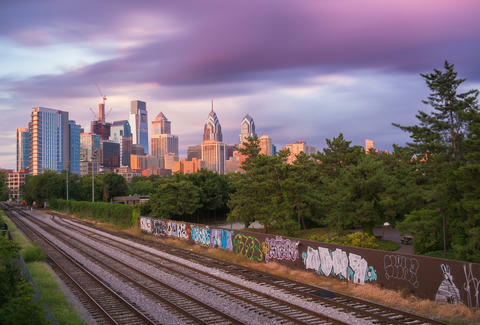 With that in mind, here are 20 of the most beautiful Philly Instagrams of 2016. Make sure to send it to your relatives who live in other, lesser cities to make them jealous. Philly is full of beautiful murals, and this one in Francisville exudes a necessary political message. Near or far, day or night, Philly looks damn impressive. No one does Christmas quite like South Street. Those lights are the miracle. Is there a more beautiful sight than coming in for the landing home? Most American cities have parted ways with street cars. Sometimes a morning stroll in West Philly is all it takes to remind you of the beautiful history -- economic and otherwise -- that our fair city possesses. Philly has some of the best -- and most beautiful -- boozing ‘round the country. Who says prison can’t be beautiful? Anyone who knows Philly knows the church-like arches of Eastern State erases any sort of spooky sensation the penitentiary gives off -- it’s eerily powerful. In what other great American city could you snap a pic of downtown and have it give off the appearance of a painting? We’re called the City of Brotherly Love for a reason. Even during construction, Philly finds a way to stand strong. There’s nothing like an introspective Philly stroll. You don’t even need to enter the newly-renovated hotel to recognize its beauty. Philly keeps its tiny streets fully functioning -- the quaint effect never wears off. The Magic Garden -- it’s literally magic! Even when the city is covered in a moody darkness, it continues to shine. Where you’re looking to explore a city or find yourself, the Delaware River beckons. That Stunning Schuylkill gets us every time. Books? We got them like any other place. We just put them in one of the most gorgeous buildings around. Just went you thought Philly couldn’t get more beautiful, it shimmers in the most surprising places. Whether you’re born and raised here or just stopping by for a visit, no sight is as alluring as the warm glow of a good cheesesteak hub.